"Windswept legs" is a term that describes an angular limb deformity in foals. The deformation causes a foal to look as though he is getting blown to one side in the wind. Angular limb deformities are not uncommon, but windswept conformation is. It affects both front legs or both hind legs when it occurs. To the layperson, windswept hind legs look as though they are both bent to one side. To get this effect, one hind leg has an outward bend, and the other hind leg is bent inward. The bend appears to occur right below the hock, the angular joint that protrudes below the stifle, or knee, of the horse. 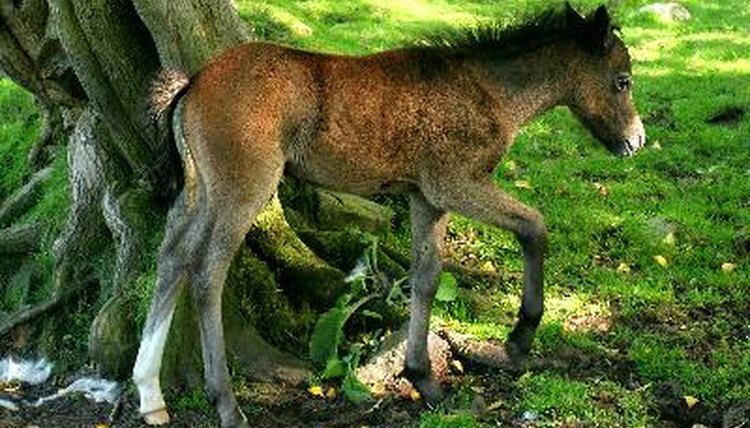 Foals that have windswept legs are generally born with the disorder, although some may develop it shortly after birth. Veterinarians and equine researchers don’t definitively know what causes windswept legs. If it is congenital, meaning the foal is born with it, some believe it can be caused by the foal’s position in the uterus or the position of the uterus itself. Genetics, a twin birth or inadequate nutrition during gestation may be factors. If a horse develops it within a few weeks after birth, suspect a nutrition issue, excessive exercise or trauma as possible causes. It’s important to have a veterinarian examine foals right after birth. Foals' long legs tend to look gawky and awkward with some appearance of deformity, so your veterinarian can tell you whether something is normal or abnormal about your foal’s early conformation. If the windswept condition is mild, it may self-correct over time. X-rays will help your veterinarian determine the extent of the deformity and likelihood of it needing medical intervention. Veterinarians and veterinary surgeons have both conservative and surgical options in treating windswept hind legs. Conservative treatment can range from confinement in a stall to leaving the foal alone -- the owner videotaping him over the course of a few months -- to see how or if the condition progresses or resolves. A veterinary surgeon may decide to perform a procedure called periosteal stripping, or periosteal transaction and elevation, whereby he cuts the sheath covering the bone. No one is exactly sure why it works, but it is relatively minor and can be repeated without fear of overcorrecting the deformity.